Ex Thread Adapters & Reducers, Stopping Plugs, Elbows & Breather Drains! 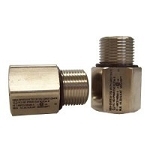 Adapters are used where the thread size of the cable gland or connection device is larger than, or of an equivalent size, to the entry thread of the enclosure. Ex approval maintains hazardous location certification and the overall integrity of the installation. Available in Metric & NPT, Nickel Plated Brass & 316 Stainless Steel. Reducers are used where the thread size of the cable gland or entry device is smaller than the entry thread of the enclosure. Ex approval maintains hazardous location certification and overall integrity of the installation. Available in Metric & NPT, Nickel Plated Brass & 316 Stainless Steel. 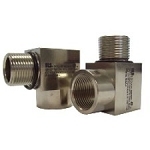 90° Elbow Adapters are designed to allow a cable gland or conduit entry where spacing or orientation makes a typical installation difficult maintaining the hazardous location certification and overall integrity of the installation. Available in Metric & NPT, Nickel Plated Brass & 316 Stainless Steel. Type 'D' & Type 'U' Stopping Plugs are used to seal unused cable gland or conduit entries in Ex approved enclosures, maintaining the hazardous location certification and overall integrity of the installation. Available in Metric & NPT, Nickel Plated Brass & 316 Stainless Steel. Breather Drain Plugs are used to allow the air inside an enclosure to breathe with the surrounding atmosphere and also to allow any moisture that enters the enclosure to drain. Type 'Bd' features Exd approval while Type 'Be' offers Exe approval. Available in Metric & NPT, Nickel Plated Brass & 316 Stainless Steel. 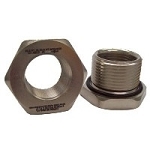 Locknuts are used to secure a threaded entry component into a piece of equipment, i.e. a cable gland, adapter, reducer, or a stopping plug to a gland plate or enclosure. Available in Metric & NPT, Nickel Plated Brass.